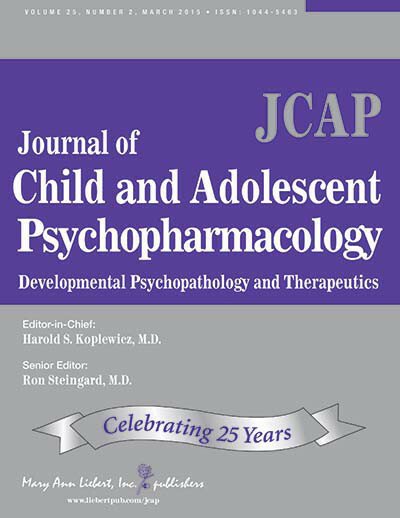 The Journal of Child and Adolescent Psychopharmacology published a special edition, in February 2015, featuring the latest research on Pediatric Acute-onset Neuropsychiatric Syndrome (PANS) and Pediatric Autoimmune Neuropsychiatric Disorders Associated with Streptococcal infections (PANDAS). “This is the first time a collection of articles concerning PANS and pediatric autoimmune neuropsychiatric disorders associated with streptococcal infections (PANDAS) has been published, and hopefully represents the first group of many more data-driven studies to come regarding youth with these conditions,” writes Drs. Kiki Chang, Harold S Koplewicz, and Ron Steingard. On May 23 and 24, 2013, the First PANS Consensus Conference was convened at Stanford University, calling together a geographically diverse group of clinicians and researchers from complementary fields of pediatrics: General and developmental pediatrics, infectious diseases, immunology, rheumatology, neurology, and child psychiatry. Participants were academicians with clinical and research interests in pediatric autoimmune neuropsychiatric disorder associated with streptococcus (PANDAS) in youth, and the larger category of pediatric acute-onset neuropsychiatric syndrome (PANS). The goals were to clarify the diagnostic boundaries of PANS, to develop systematic strategies for evaluation of suspected PANS cases, and to set forth the most urgently needed studies in this field. Presented here is a consensus statement proposing recommendations for the diagnostic evaluation of youth presenting with PANS. Objective: Pediatric acute-onset neuropsychiatric syndrome (PANS) is a subtype of obsessive compulsive disorder (OCD) marked by an abrupt onset or exacerbation of neuropsychiatric symptoms. We aim to characterize the phenotypic presentation of youth with PANS. Methods: Forty-three youth (ages 4–14 years) meeting criteria for PANS were assessed using self-report and clinician-administered measures, medical record reviews, comprehensive clinical evaluation, and laboratory measures. Results: Youth with PANS presented with an early age of OCD onset (mean=7.84 years) and exhibited moderate to severe obsessive compulsive symptoms upon evaluation. All had comorbid anxiety and emotional lability, and scored well below normative means on all quality of life subscales. Youth with elevated streptococcal antibody titers trended toward having higher OCD severity, and presented more frequently with dilated pupils relative to youth without elevated titers. A cluster analysis of core PANS symptoms revealed three distinct symptom clusters that included core characteristic PANS symptoms, streptococcal-related symptoms, and cytokine-driven/physiological symptoms. Youth with PANS who had comorbid tics were more likely to exhibit a decline in school performance, visuomotor impairment, food restriction symptoms, and handwriting deterioration, and they reported lower quality of life relative to youth without tics. Conclusions: The sudden, acute onset of neuropsychiatric symptoms, high frequency of comorbidities (i.e., anxiety, behavioral regression, depression, and suicidality), and poor quality of life capture the PANS subgroup as suddenly and severely impaired youth. Identifying clinical characteristics of youth with PANS will allow clinicians to diagnose and treat this subtype of OCD with a more strategized and effective approach. Objective: Previous studies suggest that the unexplained sudden and severe onset of obsessive-compulsive disorder (OCD) and/or tics may be infection or immune precipitated. Beta lactam antibiotics may be neuroprotective beyond their antimicrobial efficacy. We examine the preliminary safety and efficacy of cefdinir in reducing obsessive-compulsive and/or tic severity in children with new-onset symptoms. Method: Twenty subjects were randomized to receive placebo or cefdinir for 30 days for the treatment of recent-onset OCD and/or tics. The placebo group received a comparable inactive treatment matched for taste, color, and consistency. The Children’s Yale-Brown Obsessive-Compulsive Scale (CY-BOCS) and Yale Global Tic Severity Scale (YGTSS) were the primary outcome measures utilized. Results: Subjects receiving cefdinir saw notable improvements in tic symptoms, with 44.4% showing at least a 25% reduction in YGTSS (mean decrease=9.5) scores compared with 9.1% of the placebo group (mean decrease=0.13). Despite improvements, significant group differences were not observed for YGTSS (F [1, 13]=4.03, p=0.066) although there were moderate differences between group treatment effects (d=0.72). For OCD symptoms, subjects receiving cefdinir saw improvements in OCD symptoms, with 33.3% showing at least a 25% reduction in CY-BOCS scores (mean decrease=7.8) compared with 27.3% of the placebo group (mean decrease=4.7), but there were also no significant differences for CY-BOCS (F [1, 13]=0.385, p=0.546; d=0.24). Conclusions: Subjects assigned to cefdinir exhibited notable, albeit nonstatistically significant, improvements in tic symptoms, compared with the placebo group. There were also some improvements in OCD symptoms, although these were not significant. Overall, cefdinir was well tolerated. Given these preliminary results, a fully powered study is warranted to explore the efficacy of cefdinir as a therapeutic tool for new-onset pediatric neuropsychiatric symptoms, particularly those that appear to be precipitated by infection. Objective: Sudden onset clinically significant eating restrictions are a defining feature of the clinical presentation of some of the cases of pediatric acute-onset neuropsychiatric syndrome (PANS). Restrictions in food intake are typically fueled by contamination fears; fears of choking, vomiting, or swallowing; and/or sensory issues, such as texture, taste, or olfactory concerns. However, body image distortions may also be present. We investigate the clinical presentation of PANS disordered eating and compare it with that of other eating disorders. Methods: We describe 29 patients who met diagnostic criteria for PANS. Most also exhibited evidence that the symptoms might be sequelae of infections with Group A streptococcal bacteria (the pediatric autoimmune neuropsychiatric disorder associated with streptococcal infections [PANDAS] subgroup of PANS). Results: The clinical presentations are remarkable for a male predominance (2:1 M:F), young age of the affected children (mean=9 years; range 5–12 years), acuity of symptom onset, and comorbid neuropsychiatric symptoms. Conclusions: The food refusal associated with PANS is compared with symptoms listed for the new Diagnostic and Statistical Manual of Mental Disorders, 5th ed. (DSM-V) diagnosis of avoidant/restrictive food intake disorder (ARFID). 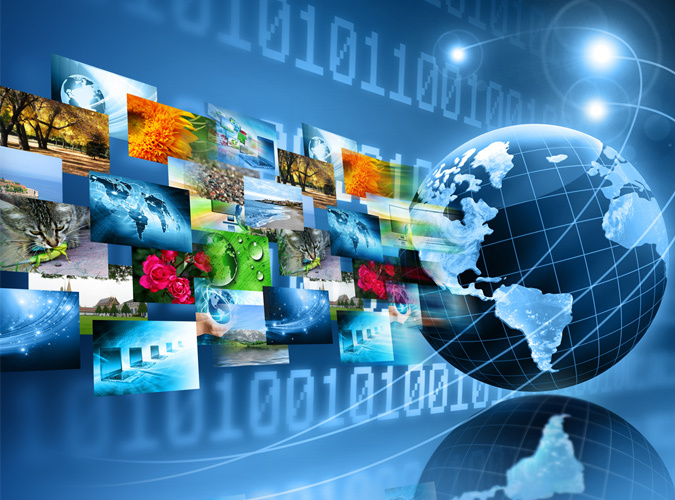 Treatment implications are discussed, as well as directions for further research. To cite this article: Gerardi Diana M., Casadonte Joseph, Patel Priyal, and Murphy Tanya K. Journal of Child and Adolescent Psychopharmacology. February 2015, 25(1): 93-98. doi:10.1089/cap.2014.0064. Published in Volume: 25 Issue 1: February 19, 2015. Online Ahead of Print: October 20, 2014. Kleine–Levin syndrome (KLS) is a sleep disorder of unknown etiology characterized by episodic hypersomnia, hyperphagia, cognitive and mood abnormalities, and abnormal behaviors. The average age of onset is 15 years, and males are more frequently affected than females (Gadoth et al. 2001; Arnulf et al. 2005, 2008). Active episodes have an average duration of 10–13 days with reoccurrences averaging every 3.5 months, with patients typically asymptomatic between episodes (Arnulf et al. 2005, 2008). Computed tomography (CT) and magnetic resonance imaging (MRI) of the brain are typically normal in patients with KLS (Servan et al. 1993; Poryazova et al. 2007; Huang et al. 2012b), and polysomnography tends to display impairment of slow wave sleep and rapid eye movement sleep at symptom onset (Huang et al. 2008). Studies of the long-term effects of KLS are limited, but short-term memory dysfunction, academic decline, and auditory-verbal attention deficits have been observed even during periods of remission (Fontenelle et al. 2000; Landtblom et al. 2003). Pediatric autoimmune neuropsychiatric disorder associated with streptococcus (PANDAS) is a disorder characterized by an acute, sudden onset of obsessive-compulsive disorder (OCD) and/or tics, often accompanied by attention deficit/hyperactivity, separation anxiety, oppositional behaviors, and emotional lability (Swedo et al. 1998). Personality changes, cognitive disturbances, motor abnormalities, sensory sensitivity, behavioral regression, and, occasionally, psychosis are also often present (Bernstein et al. 2010; Murphy et al. 2012). The pathogenesis of PANDAS is hypothesized to be related to group A streptococcal (GAS) infections via molecular mimicry, in that streptococcal antibodies target brain proteins of similar epitopic structure to that of GAS (Cunningham 2012). PANDAS exhibits immunological similarities to Sydenham’s chorea (SC), a classic infection-triggered autoimmune disorder that also presents with a high degree of OCD comorbidity (Swedo et al. 1989). However, unlike SC, definitive evidence for autoantibody-mediated reactions in PANDAS has been less conclusive (Brilot et al. 2011; Morris-Berry et al. 2013). A newer iteration of acute-onset neuropsychiatric symptoms not dependent upon a GAS association is termed “pediatric acute-onset neuropsychiatric syndrome” (PANS) (Swedo et al. 2012). Given the dramatic phenotype and the potential for long-standing neuropsychiatric sequelae, PANS is perhaps a subtype of autoimmune encephalopathy affecting primarily psychiatric symptom domains rather than the neurological symptom domains typical of other encephalopathies. For a complete review of the clinical presentation, assessments, and proposed pathophysiology of PANS/PANDAS, please see our referenced reviews (Chang et al. forthcoming, Murphy et al. 2014). Our aim is to report a case of a 9-year-old boy who exhibited symptoms of both KLS and PANDAS. This case is the second that calls attention to two uncommon syndromes that can occur concurrently (Das and Radhakrishnan 2012). We also provide a brief literature review to discuss symptom overlap and similar hypothesized pathogeneses. Background: The first cases of pediatric autoimmune neuropsychiatric disorders associated with streptococcal infections (PANDAS) were described>15 years ago. Since that time, the literature has been divided between studies that successfully demonstrate an etiologic relationship between Group A streptococcal (GAS) infections and childhood-onset obsessive-compulsive disorder (OCD), and those that fail to find an association. One possible explanation for the conflicting reports is that the diagnostic criteria proposed for PANDAS are not specific enough to describe a unique and homogeneous cohort of patients. To evaluate the validity of the PANDAS criteria, we compared clinical characteristics of PANDAS patients identified in two community practices with a sample of children meeting full research criteria for PANDAS. Methods: A systematic review of clinical records was used to identify the presence or absence of selected symptoms in children evaluated for PANDAS by physicians in Hinsdale, Illinois (n=52) and Bethesda, Maryland (n=40). Results were compared against data from participants in National Institute of Mental Health (NIMH) research investigations of PANDAS (n=48). Results: As described in the original PANDAS cohort, males outnumbered females (95:45) by ∼ 2:1, and symptoms began in early childhood (7.3±2.7 years). Clinical presentations were remarkably similar across sites, with all children reporting acute onset of OCD symptoms and multiple comorbidities, including separation anxiety (86–92%), school issues (75–81%), sleep disruptions (71%), tics (60–65%), urinary symptoms (42–81%), and others. Twenty of the community cases (22%) failed to meet PANDAS criteria because of an absence of documentation of GAS infections. Conclusions: The diagnostic criteria for PANDAS can be used by clinicians to accurately identify patients with common clinical features and shared etiology of symptoms. Although difficulties in documenting an association between GAS infection and symptom onset/exacerbations may preclude a diagnosis of PANDAS in some children with acute-onset OCD, they do appear to meet criteria for pediatric acute-onset neuropsychiatric syndrome (PANS). Background: Pediatric acute-onset neuropsychiatric syndrome (PANS) is diagnosed by the abrupt onset of new obsessive compulsive disorder (OCD) or food-restricting symptoms, and at least two of a variety of other neuropsychiatric symptoms. Detailed clinical presentation of youth with this condition has not yet been provided in the literature. Methods: We review the clinical charts of five youth meeting criteria for PANS in our PANS Clinic. 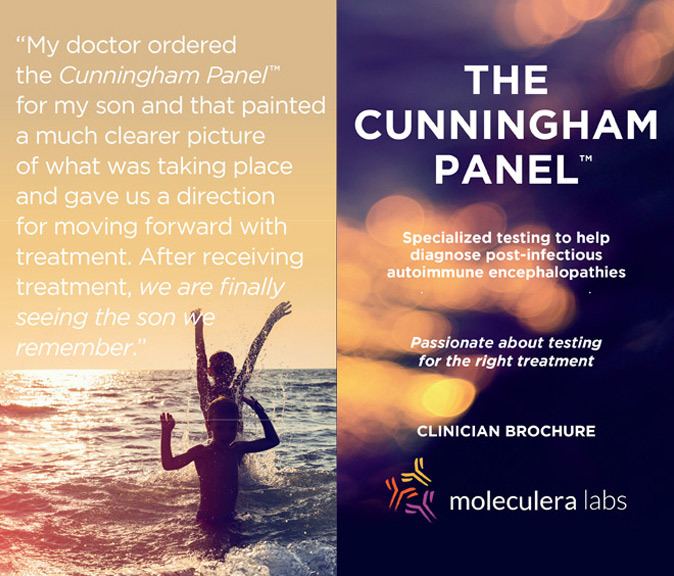 These five patients were selected for differing underlying causes thought to be driving an inflammatory response that appeared to impact psychiatric symptoms. Results: Five youth with varying potential etiologies impacting neuropsychiatric symptoms were identified. These youth were from 8 to 18 years old at the onset of their PANS illness, and had bacterial, autoimmune, and unknown etiologies. Treatment directed at presumed etiologies ranged from antibiotics to intravenous gamma globulin (IVIG) to other immunomodulatory regimens, and appeared to improve the psychiatric illness. Conclusions: Youth with PANS may present in differing ways, with psychiatric and physical symptoms overlapping with inflammatory or infectious diseases, pain syndromes, and other psychiatric diagnoses. Patients’ psychiatric symptoms may respond to treatments targeting the underlying cause of physical illness. Faced with a pediatric patient demonstrating the abrupt onset or exacerbation of psychiatric and physical symptoms, clinicians should consider PANS in their differential diagnosis. Background: Abrupt, dramatic onset obsessive-compulsive disorder (OCD) and/or eating restriction with at least two coinciding symptoms (anxiety, mood dysregulation, irritability/aggression/oppositionality, behavioral regression, cognitive deterioration, sensory or motor abnormalities, or somatic symptoms) defines pediatric acute-onset neuropsychiatric syndrome (PANS). Descriptions of clinical data in such youth are limited. Methods: We reviewed charts of 53 consecutive patients evaluated in our PANS Clinic; 47 met PANS symptom criteria but not all met the requirement for “acute onset.” Patients meeting full criteria for PANS were compared with patients who had a subacute/insidious onset of symptoms. Results: Nineteen of 47 (40%) patients in the study had acute onset of symptoms. In these patients, autoimmune/inflammatory diseases and psychiatric disorders were common in first-degree family members (71% and 78%, respectively). Most acute-onset patients had a relapsing/remitting course (84%), prominent sleep disturbances (84%), urinary issues (58%), sensory amplification (66%), gastrointestinal symptoms (42%), and generalized pain (68%). Inflammatory back pain (21%) and other arthritis conditions (28%) were also common. Suicidal and homicidal thoughts and gestures were common (44% and 17%, respectively) as were violent outbursts (61%). Group A streptococcus (GAS) was the most commonly identified infection at onset (21%) and during flares (74%). Rates of the above mentioned characteristics did not differ between the acute-onset group and the subacute/insidious-onset groups. Low levels of immunoglobulins were more common in the subacute/insidious-onset group (75%) compared with the acute-onset group (22%), but this was not statistically significant (p=0.06). Conclusions: In our PANS clinic, 40% of patients had acute onset of symptoms. However, those with and without acute onset of symptoms had similar symptom presentation, rates of inflammatory conditions, somatic symptoms, and violent thoughts and behaviors. GAS infections were the most commonly identified infection at onset and at symptom flares. Because of the wide variety of medical and psychiatric symptoms, youth with PANS may require a multidisciplinary team for adequate care management. This is a case series describing 12 youths treated with intravenous immunoglobulin (IVIG) for pediatric autoimmune neuropsychiatric disorder associated with streptococcal infection (PANDAS). Although it is a clinically based series, the case reports provide new information about the short-term benefits of IVIG therapy, and are the first descriptions of long-term outcome for PANDAS patients. Background: Because of its reported similarities to Sydenham chorea, therapeutic plasma apheresis (TPA) has been proposed as a potential treatment of pediatric autoimmune neuropsychiatric disorders associated with streptococcal infections (PANDAS). To date, support for the use of TPA has been limited to a few anecdotal reports and a small placebo-controlled trial demonstrating dramatic symptom improvements at 1 month and 1 year follow-up. To evaluate the safety and efficacy of TPA further, we undertook a retrospective review of all PANDAS patients treated with TPA at Georgetown University Hospital between August 2009 and October 2013. Methods: Forty patients were identified, and sufficient information was available from medical records and telephone interview for 35 cases (88%). All 35 (23 boys; 12 girls) met diagnostic criteria for PANDAS (Swedo et al. 1998) and had severe symptoms. The TPA procedures were performed at Georgetown University Hospital using a protocol that processes a total of 4.5 blood volumes over 3–5 days (three treatments of 1.5 volumes each). Overall symptom improvements at 6 months post-TPA and long-term follow-up were estimated by parents, who also rated changes in individual symptoms to provide information about patterns of improvement. Results: All patients were reported to have received at least some benefit from TPA, with average improvement of 65% at 6 months post-TPA and 78% at longer-term follow-up. A decrease in the number of reported symptoms also occurred, with particular improvements in obsessive-compulsive disorder (OCD), anxiety, tics, and somatic symptoms, including dysgraphia, sleep difficulties, and urinary urgency or frequency. Contrary to expectations, preceding duration of illness was not correlated with degree of improvement following TPA, suggesting that acuity of illness is not a factor affecting response. Only two adverse events were reported: both involved reopening of the site where the central line had been placed and resolved immediately following application of pressure and re-dressing of the puncture site. Conclusions: Therapeutic plasma apheresis is an invasive medical intervention that should be reserved for treatment of children and adolescents who are severely affected by PANDAS. In such patients, it appears to be a safe, well-tolerated, and beneficial treatment option. Methods: Study participants (n=311; ages 4–27 years, 66% male) were selected from a larger group of individuals with self-reported neuropsychiatric symptoms (n=742) and included only those with accurate knowledge of group A streptococcal infection status, except for four individuals in whom streptococcal infection status was unknown. Healthy control samples (n=16; ages 5–14 years, 81% male), came from the National Institute of Mental Health and Yale University. In addition to serum donations, participants and/or legal guardians provided neuropsychiatric and related medical histories of symptoms that had lasted >1 year. 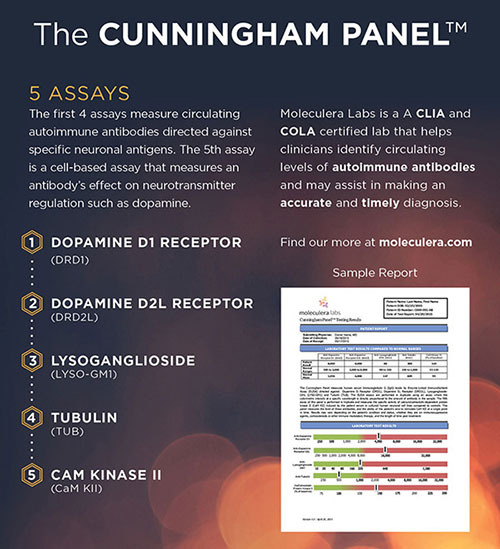 Antineuronal immunoglobulin G (IgG) titers were measured by standard enzyme-linked immunosorbent assay (ELISA) and compared with mean titers of normal age-matched sera against lysoganglioside, tubulin, and dopamine receptors (D1R and D2R). Antibody-mediated signaling of calcium calmodulin dependent protein kinase II (CaMKII) activity in a human neuronal cell line (SK-N-SH) was tested in serum. Results: Of 311 individuals, 222 (71%) had evidence of group A streptococcal infection, which was associated with tics and/or OCD status (p=0.0087). Sera from individuals with tics and/or OCD (n=261) had evidence of elevated serum IgG antibodies against human D1R (p<0.0001) and lysoganglioside (p=0.0001), and higher serum activation of CaMKII activity (p<0.0001) in a human neuronal cell line compared with healthy controls (n=16). Furthermore, patients with tics and OCD had significantly increased activation of CaMKII activity compared with patients with only tics or only OCD (p<0.033 for each). Conclusion: Our study suggested a significant correlation of streptococcal-associated tics and OCD with elevated anti-D1R and antilysoganglioside antineuronal antibodies in serum concomitant with higher activation of CaMKII in human neuronal cells. Youth and young adults with chronic tics and OCD may have underlying infectious/immunologic etiology. Background: Studies have noted immunological disruptions in patients with tic disorders, including increased serum cytokine levels. This study aimed to determine whether or not cytokine levels could be correlated with tic symptom severity in patients with a diagnosed tic disorder. Methods: Twenty-one patients, ages 4–17 years (average 10.63±2.34 years, 13 males), with a clinical diagnosis of Tourette’s syndrome (TS) or chronic tic disorder (CTD), were selected based on having clinic visits that coincided with a tic symptom exacerbation and a remission. Ratings of tic severity were assessed using the Yale Global Tic Severity Scale (YGTSS) and serum cytokine levels (interleukin [IL]-2, IL-4, IL-5, IL-10, IL-12p70, IL-13, interferon [IFN]-γ, tumor necrosis factor [TNF]-α, and granulocyte macrophage-colony stimulating factor [GM-CSF]) were measured using Luminex xMAP technology. Results: During tic symptom exacerbation, patients had higher median serum TNF-α levels (z=−1.962, p=0.05), particularly those on antipsychotics (U=9.00, p=0.033). Increased IL-13 was also associated with antipsychotic use during exacerbation (U=4.00, p=0.043) despite being negatively correlated to tic severity scores (ρ=−0.599, p=018), whereas increased IL-5 was associated with antibiotic use (U=6.5, p=0.035). During tic symptom remission, increased serum IL-4 levels were associated with antipsychotic (U=6.00, p=0.047) and antibiotic (U=1.00, p=0.016) use, whereas increased IL-12p70 (U=4.00, p=0.037) was associated with antibiotic use. Conclusions: These findings suggest a role for cytokine dysregulation in the pathogenesis of tic disorders. It also points toward the mechanistic involvement and potential diagnostic utility of cytokine monitoring, particularly TNF-α levels. Larger, systematic studies are necessary to further delineate the role of cytokines and medication influences on immunological profiling in tic disorders.